We provide a variety of lift options to meet your mobility needs: platform lifts, arm-type lifts, wheelchair securement systems, and ramps. 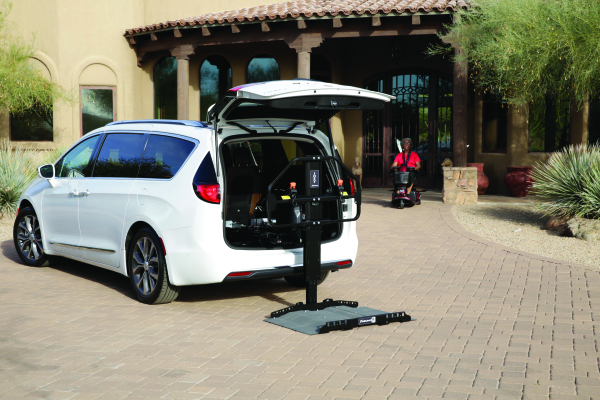 Our mobility specialists can match your needs (your vehicle, your wheelchair/scooter, your abilities) to your lift options. We provide equipment & service for private and public use vehicles. Click on the tabs to the left of your screen to learn more. Alaska Stairlift & Elevator, LLC is a registed vehicle modifier with the National Highway Traffic Safety Administration. The adaptive equipment and lifts we provide also comply with the Federal Motor Vehicle Safety Standards. If your adaption doesn't comply, we'll notify you what issues may be in nonconformance. Your safety is our priority. Arm-type lifts raise/lower an unoccupied wheelchair lift into the vehicle, eliminating heavy lifting. Arm-type lifts are custom matched to your vehicle year/make/model and the make/model of your mobility device. Our mobility specialists can help determine what system will work best for you. While your vehicle is in motion, your mobility device should be safely secured with a wheelchair securement system. Securement systems are easy to operate and can help prevent injuries if you have to make a sudden stop or are involved in a collision. There are two styles of securement systems: Securement straps or a mechanized docking/securement system. Straps (tie-downs): The mobility device is secured with straps, usually 4, that retract/tighten similar to a seat belt. The tie-down retractors/belts are secured to track or oval pockets installed in the floor of the vehicle. The track is usually surface-mounted but can be recessed if desired. 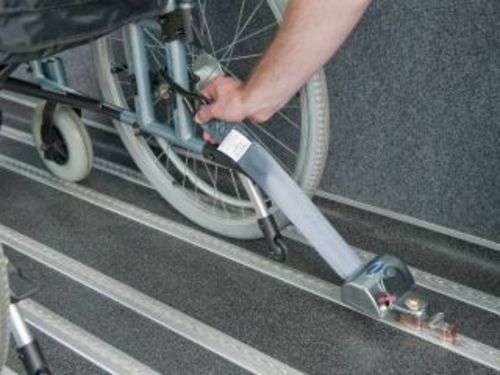 Docking System: A bracket is installed on the frame of the wheelchair and engages to a post or floor-mounted docking system that locks the wheelchair into place. This system requires power and is hard-wired into the vehicle. Portable, folding ramps can be used as needed and stored in your garage or home when not in use. They can weigh 36 - 63 lbs. depending on length. 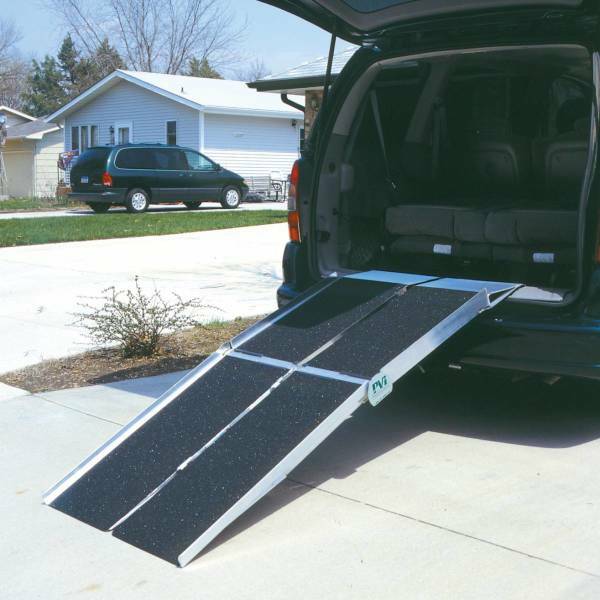 Spring-assisted ramps mount to the floor of your vehicle and are easily operated by one person. They are installed and remain in the vehicle in the upright/folded position when not deployed. Appropriate ramp length depends on the distance from the ground to the floor of your vehicle. To schedule an evaluation of your vehicle or discuss your options, please call us at (907) 245-5438.